If you’re limited on space in your back-of-house area, then you’ve come to the right place. Our dual temperature work top refrigerators and freezers have a convenient undercounter design that won’t take up much room in your kitchen. 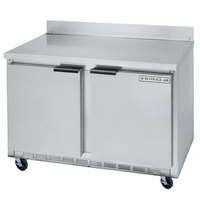 Thanks to their dual temperature capabilities, you can easily keep your refrigerated and frozen products at safe storage temperatures in the same place. 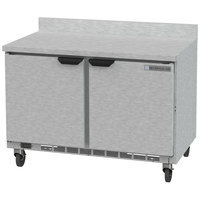 These products also feature wire shelves that make it simple to keep your unit organized. Also make sure to check out other great items from Beverage-Air. 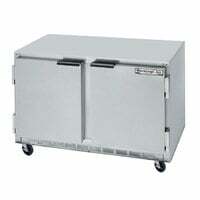 Store your cool and frozen items all in the same unit with dual temperature undercounter refrigerators and freezers. 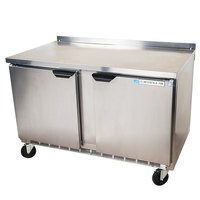 These products feature a useful worktop space that your employees can use to do prep work with ingredients right out of the fridge. Dual temperature refrigerators and freezers also come equipped with casters, so they’re easy to move when it's time to clean your kitchen. 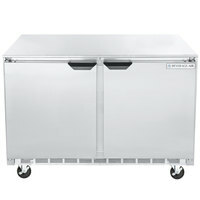 These units even have a stainless steel exterior that is effortless to keep clean. For more refrigeration equipment, check out our refrigeration air fresheners, defrost timers, and refrigeration lighting. 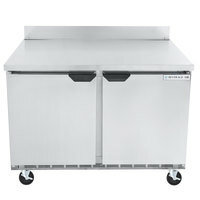 If you're wondering where to buy dual temperature work top and undercounter refrigerators / freezers, we have a large selection of dual temperature work top and undercounter refrigerators / freezers for sale at the lowest prices.